File Needles discarded in a homeless camp. It was the most pointed question in a meeting full of them. Eureka City Councilmember Kim Bergel looked at Humboldt Area Center for Harm Reduction Programs Coordinator Jessica Smith and board treasurer Rachel Waldman, leaned into the microphone and gave voice to a rumor — an allegation hurled on a social media platform without a shred of evidence — that had somehow taken hold among some critical of the controversial nonprofit. "Does HACHR provide drugs to people?" Bergel asked. "No," replied Smith. "We do not provide drugs." It was a pointed moment. Bergel was trying to illustrate just how distrustful some segments of Eureka are of HACHR, which started a few years ago and operates one of only two needle exchange programs in Humboldt County. (The other is run by the Humboldt County Department of Health and Human Services.) HACHR has become a flashpoint in Eureka, a fact that was on clear display at the July 17 city council meeting, during which a couple of dozen members of the public stepped to the podium to either voice support for the harm reduction program, saying it does good work and saves lives in the face of a growing drug epidemic, or malign it, saying it does little more than enable addicts who leave the city littered with used syringes. 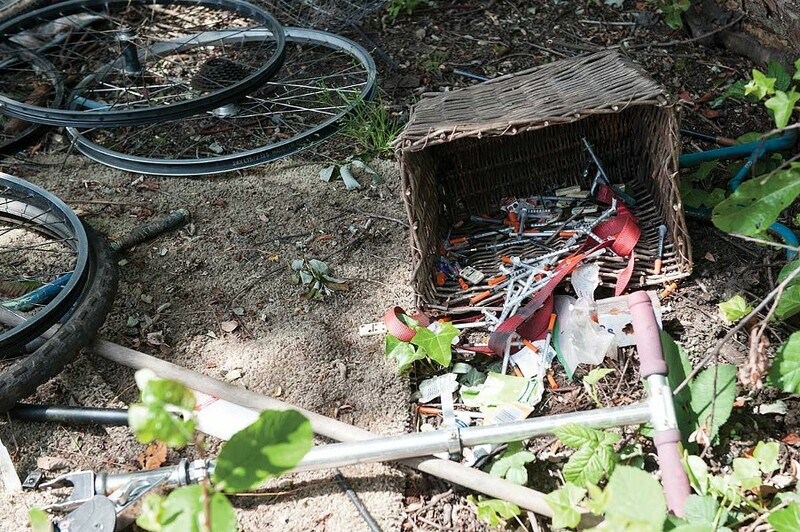 "There's needles all over this county — it's disgusting and it has to end," said one man. "You members of the city council are enabling addicts — you're not helping them," said another. "How does enabling them to continue their drug use and avoid every adult decision that the rest of us have to make daily help them put their lives in order? Government programs at every level — including yours — have created a never-never land populated by a bunch of drug-addicted Peter Pans. Which community do you serve? The drug-addicted Peter Pans of Third World never-never land or the hard working community that supports this nonsense with their tax dollars and votes in elections? Please remember which community you serve." There's little question as to Eureka's need for a needle exchange program, as they have been repeatedly proven to reduce the spread of disease and to improve health outcomes. Humboldt County has hepatitis C infection rates five times the national average and three times that of the state, as well as an opioid overdose rate five times that of the rest of California. Humboldt County's addiction problems extend well beyond injection drug use, with an alcohol-related liver disease rate that's twice the state average and more opioid prescriptions than county residents, according to reports from the Humboldt County Department of Health and Human Services and the state department of public health. During HACHR's report to the board July 17, Smith reported that the program distributed 735,823 new syringes in 2017 and took back 688,390 used ones for a return rate of roughly 93.5 percent — about 3.5 percent higher than the industry standard. Additionally, the group reported that it referred 189 people to drug treatment services and distributed more than 2,700 Naloxone opioid overdose reversal kits, resulting in 185 self-reported reversals from clients. The nonprofit also has the company EcoMed weigh returned needles before they are disposed of, providing a kind of third-party audit to corroborate HACHR's numbers. But when the conversation turned back to the city council, it was clear some of their concerns extended well beyond audits or numbers. "My concern isn't the work HACHR does," Bergel said. "My concern is the divisiveness and the lack of positive relationships happening in our community. That is my concern. With any relationship, you get to a place where you just cannot put the toothpaste back in the tube. You just cannot do it. I don't know as a community how we're going to bridge this, how we're going to make this situation work. ... I think HACHR has done much of what they said and I think we definitely need to have a needle exchange in our city, but I don't know that HACHR is the right one, and it pains me to say that." Bergel then asked that staff agendize a discussion on HACHR's future — including the possibility of withdrawing the council's authorization of its needle exchange program — for the council's Aug. 7 meeting. Part of Bergel's frustration seems to have stemmed from a meeting she and fellow Councilmember Heidi Messner had with HACHR's board of directors in June. The council members had requested to attend the board's regular monthly meeting and showed up with a document including two requests. "The city of Eureka is requiring a 90-day probationary period of the following requirements," it read. "We are open to dialogue but either way the following will be required." The document went on to specify that HACHR was to begin giving Eureka City Manager Greg Sparks weekly reports on the number of needles it distributes and collects, how many referrals it makes to treatment services and how many needles it finds during weekly cleanup activities. Additionally, the document specifies that two members of HACHR's board are to sit on an advisory board, along with two community members, a public health advisor and one or two council members. The document ends with a warning that "lack of compliance will result in a recension" of the program's authorization. Sarah Kerr, HACHR's board chair, said that prior to the meeting she'd just been told the council members wanted about 15 minutes to speak to the board and that the "requests" — as Messner referred to them at the July 17 meeting — kind of came out of the blue. "It reads and felt to us very much like a demand with an ultimatum attached," she said. But at the July 17 meeting, Messner implied that HACHR had insisted on getting to select the community members who would ultimately participate on the board and said Kerr and her board had generally been nonresponsive to the requests. Reached by the Journal on Monday and asked whether Messner and Bergel were acting on behalf of and delivering an ultimatum approved by the council when they addressed the HACHR board, Sparks said they were not. "Really, they just represented themselves as two council members," he said. "They weren't speaking for the entire city." Whatever exactly transpired, it seems the council members' appearance at the June 20 board meeting, and their subsequent comments at the council meeting a month later, left many frustrated. Chris said it's important to put HACHR's work into context, to understand that the nonprofit started to meet an existing need and didn't create the problem of addiction or syringe litter, as some intone. "By that logic, five years ago there weren't any syringes on the ground — it was all ice cream trucks and unicorns, like this place was spotless," he said. Outside, Stacey Cobine — who became somewhat of a public figure when she and 10 other homeless residents of the PalCo Marsh sued the city in an effort to stop plans to clear the entrenched homeless encampments behind the Bayshore Mall in 2016 — was busily weeding a flower garden out front. Cobine, who says she got involved with HACHR while still living in the marsh, said there's a correlation between the clearing of the marsh (colloquially known as the Devil's Playground) and the rising alarm about syringe litter throughout town. "Now the whole town is the Playground. It looks terrible," she said, adding that the displacement of hundreds of homeless people living in the marsh took a problem that had existed out of sight and dumped it into neighborhoods, parks and city streets. In recent years, the city has also condemned the Budget Motel and a handful of low-income rentals owned by Floyd and Betty Squires — including one commonly referred to as the "heroin Hilton" because of rampant drug use that took place there — turning more than 110 people out onto the streets with few options of where to go. "All those places closed down and there's no replacement. Where do all these displaced people go?" Cobine asked. Part of the frustration surrounding the needle exchange conversation is there's no way to differentiate one hypodermic syringe from another, no way to tell if the needle found in a greenbelt or a playground came from a pharmacy, the county's exchange program, HACHR or someplace else. There's likewise no way to tell where the needles returned to HACHR or dropped in a disposal kiosk originated. Back in the HACHR office, as Cobine worked in the garden outside and Chris separated cotton swabs, the morning's needle exchange was in full swing with Smith sitting in a small office surrounded by shelves full of supplies. The small two-story building, which is offered to the nonprofit rent-free by Open Door Community Health Clinics, was crammed with supplies and bustling with activity. There's a clothing closet and a miniature food pantry. The smell of spaghetti wafted down the hall from a newly installed kitchen — the North Coast Co-op donated appliances and a former client in recovery did the construction — and a county social worker is set up in a nearby room to do consultations. Upstairs, a pair of herbalists offer calming teas and natural salves. Smith, who started working with HACHR after its Executive Director Brandie Wilson came to speak at one of her graduate sociology classes at Humboldt State University, was staffing the exchange. The idea, she said, is to be friendly and welcoming — to ask people how they're doing, what they need. Throughout the day, a steady stream of people came in to drop off needles and get fresh ones. Some brought in their used "rigs" in plastic bottles, while others had the medical grade sharps containers HACHR dispenses. They'd tell Smith how many they were returning — anywhere from a couple to dozens — and she'd look them over and do a quick count, documenting the number in a ledger. Then she'd ask how many they wanted back, asking clients their specific preference of needle gauge and syringe type. A middle-aged woman came in clearly distressed. Her cheeks were visibly flushed under a layer of dirt, her eyes bloodshot. She asked for 20 needles. "I can't give them to you unless you return some," Smith said, drawing mild protests from the woman, who insisted she didn't have any. "Well, you can go pick some up then." "I'm not going to do that," the woman said. "You have to want it," Smith said, handing her a safe injection kit and sending her on her way. A few minutes later, a young man with a dirty gray sweatshirt came in. "You got some new glasses?" Smith asked. "They look nice," Smith said, taking the two plastic soda bottles filled with syringes from the man and giving him a few packages of fresh ones. "Would you like some Narcan?" she asked, offering the nasal spray used to reverse overdoses. When he nods she asks if he's had to use the stuff recently. "Yeah, I actually did," he said. "Did you use just one dose?" As he was leaving, a young woman asks Smith if she can use the phone — hers has run out of batteries. Behind her, another young woman emerged from the bathroom brushing her hair, a glint of water still visible on her freshly washed face. Around the back of the building, four people sit around a folding table doing various art projects — one man is fixated on a coloring page as a woman sitting across from him is molding something out of clay. Another man is working on a miniature Yurok bow carved from yew wood. Having put away her gardening supplies, Cobine is taking a moment to relax while still decrying the public backlash against HACHR. She's asked about the charge that the nonprofit simply enables addicts. "We are enabling," she fired back. "We're enabling them to take some control of their lives. We're enabling them to make healthier choices. We're enabling them to stop spreading diseases. We're enabling them to feel human because we look them in the eye and talk to them about what they need." Whether the nonprofit will be able to continue to do that in Eureka will be up for discussion Aug. 7. Editor's note: This story was updated from a previous version that misstated how Humboldt County's hepatitis C rates compare to those of the state and nation. The Journal regrets the error.